Don Brand Fences and Gates offers maintenance free PVC fencing solutions so that customers don’t have to worry about re-painting, rotting, warping, termites, corrosion or rusting again. PVC fences are suitable for landscape, privacy or pool fences, rural properties, residential homes and even commercial or government buildings. The PVC fences feature a triple ribbed rail for superior strength and high UV protection, made to withstand harsh Australian conditions. They are graffiti resistant and water based paints (for example, from spray cans) can be easily washed off with water. 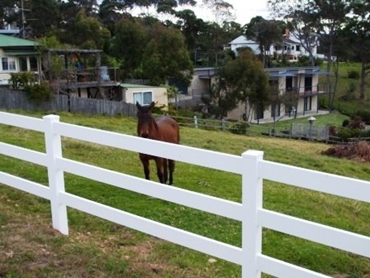 PVC fencing solutions are the safe choice if children, horses and livestock are involved, as they have a smooth, non-porous surface with no sharp edges or splinters (unlike wood that has a tendency to break leaving sharp splinters).